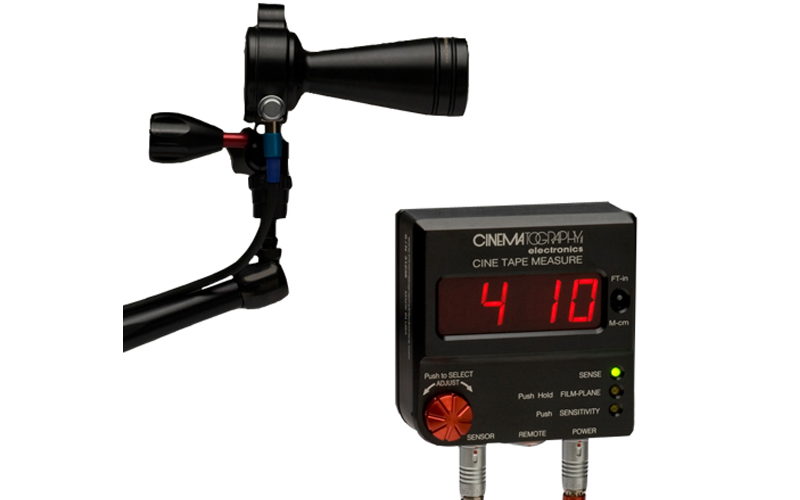 The CINE TAPE MEASURE system is a small, rugged, lightweight and quiet ultrasonic range finder. It is compatible with all lenses and cameras. In addition, the system is easy to set up and use, making it the first choice of professional filmmakers. The innovative Cinematography Electronics SENSOR ASSEMBLY consists of two small cone-shaped horns, a miniature pan tilt mechanism, a mounting stud and an electrical connector. The horns send and receive ultrasonic signals that are used to calculate the distance measurement. Mounting the SENSOR ASSEMBLY onto a camera package is simple with the combo stud. With its pan and tilt adjust/lock knobs, aiming the horns towards the subject is quick and straightforward. The SENSOR ASSEMBLY interfaces to the control via a short detachable Sensor Cable. A spring-loaded holder permits laser pens to be attached parallel to the sensors, providing a visual reference during calibration.